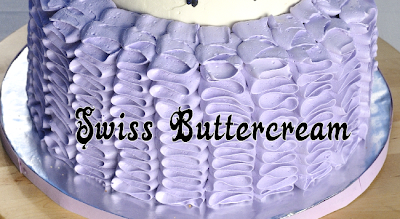 Swiss Meringue Buttercream is so silky and delicious. Once your try it there is no looking back. If you haven’t tried this buttercream be ready for super silky melt in your mouth texture. It’s also a joy to work with. It pipes beautifully on cakes and cupcakes. Place the egg whites and the sugar in a clean bowl of your mixer and place it over a pot of simmering water, whisking constantly, until egg whites get too hot to touch, you want the sugar to dissolve and bring the egg whites to a safe temperature for use. Attach a candy thermometer and stir the egg whites until the thermometer reads 160-170F. Remove the bowl from the pot. Place the bowl on a stand mixer and beat it on high until stiff and shiny peaks are formed and sides of the bowl are lukewarm to the touch. Gradually add room temperature butter, beating well after each addition. Don't worry if the mixture curdles a little, turn the mixer on medium high and beat until you have a silky buttercream . Add 1 tbl pure vanilla extract and beat the buttercream for a few more minutes, until well combined. This buttercream can be stored at room temperature for a couple of days, or refrigerated for a week, or frozen for up to 3 months. Bring it to room temperature and re-whip it prior using. If using in the heat of the summer, you can substitute 1 stick of butter for shortening that can hold up to better in hotter temperatures. I personally try to avoid using traditional shortening. You can try using other better for your shortenings that are available. In the hot months I also like to add about 2tbl meringue powder per batch, once the buttercream is all whipped and made, ready to go I mix in meringue powder to stabilize it little more. Remember butter starts to melt at 82.4F -96.8F (26-36C), so if you are planning to make this buttercream in the heat of the Summer, consider cake, or cupcake display inside, in the air conditioned area. Chocolate Swiss Buttercream : add 1/2 cup melted and cooled chocolate mixed with 1/2 cup dark cocoa powder. Caramel Swiss Buttercream : add 1/2 cup to 1 cup thick caramel sauce. Coffee Swiss Buttercream : dissolve 2tbl espresso powder in 2tbl warm water. Let cool and beat into the buttercream. Strawberry Swiss Buttercream : beat in 1/2 cup to 1cup strawberry puree. 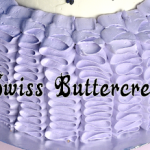 Swiss Buttercream is super versatile. Regardless of the final flavor you are looking for always start with little bit of vanilla extract. I consider it a mother of sweet flavors. It’s really easy to make Chocolate, Coffee, Maple, Caramel and even Strawberry Swiss Buttercream. When do we put the meringue powder? Is it after whipping the syrup to stiff peaks or before whipping the syrup? Can butter be substituted with high ratio shortening? Haniela, you make cookie decorating look so easy. I've tried and not so much luck but I'll keep trying. I really enjoy your YouTube videos and your webpage. Merry Christmas to you and a very happy New Year to you and yours! Thanks for sharing your recipe Haniela!! It sounds delicious! Es fantastico tu Blog…… tienes cosas muy hermosas!